The second picture below shows the alate form that has returned to apple from the secondary host in autumn. Evenhuis (1968) provides an excellent description of the life cycle of Rhopalosiphum oxyacanthae through the year. 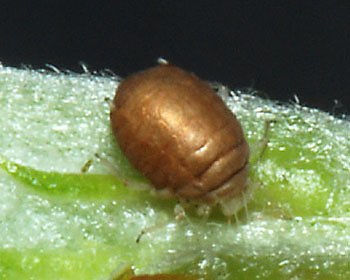 The aphid hibernates in the egg stage on apple and related plants. The eggs start hatching in late March, and most of the eggs have hatched by about mid-April. The first fundatrices (stem mothers) are usually full-grown by the second half of April, as shown in the picture below. In April they come under attack from a range of parasitoids and predators. 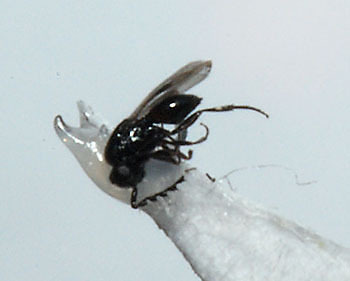 The first picture below shows an apterous nymph exuding liquid from its siphunculi. This liquid contains alarm pheromones and was probably exuded in response to an attack by a parasitoid or predator. The second picture above shows an aphid mummy parasitized by the braconid Monoctonus cerasi. 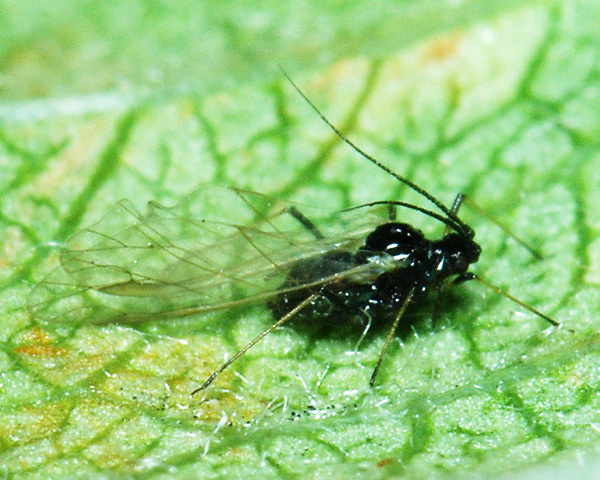 This is the commonest parasitoid of the apple aphid. In autumn it hibernates as a full-grown larva within the dead, mummified aphid host, often in bark crevices. The adults then emerge early next spring in the season, and attack the maturing fundatrices. The first picture above shows an adult Monoctonus searching for apple aphids in April. 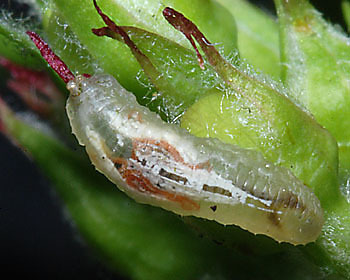 The parasitized aphids are mummified and, within a few days, the second generation of parasitoids emerge. These then attack the next generation of aphids on apple. However, some mummies are themselves attacked by hyperparasites which kill the parasitoid larva. Four hymenopterous hyperparasites have been bred from aphids on apple - the second picture above shows Asaphes vulgaris (Miscogasteridae). 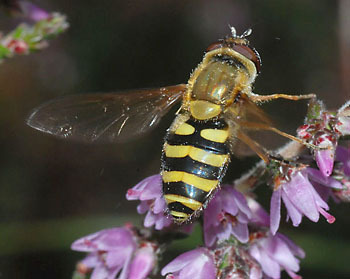 Syrphid larvae (Diptera, Syrphidae = hoverflies) may be more important in reducing the number of aphids. The larva pictured below is probably Syrphus ribesii, although Syrphus vitripennis and Epistrophe balteata are also commonly bred from apple-grass aphid colonies on apple. It is difficult to appraise the real importance of syrphids in respect to the apple-grass aphid. Evenhuis (1968) had the impression that they were not very important, as he found them in larger numbers only when the population density of the aphids was rather high. We however are less certain about this as early in the year we have observed quite heavily infested trees to be apparently 'cleansed' of aphids by small numbers of syrphid larvae. 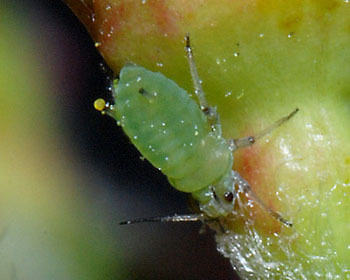 The surviving aphid progeny of the fundatrices become full-grown, winged aphids from the beginning of May. These then migrate to quite a number of grass species, where they pass through a number of parthenogenetic generations on the roots of grasses. Winged females return to apple trees in the autumn and produce oviparae. 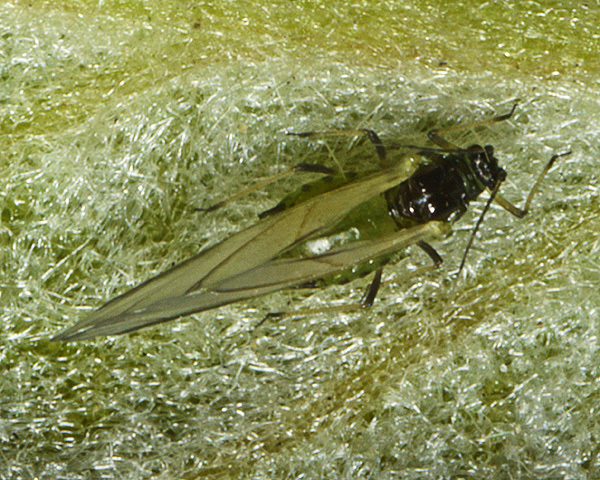 The developing oviparae are often attacked by the third generation of aphid parasitoids (Monoctonus) which did not follow them on to grasses, but went into a state of summer diapause on apple. 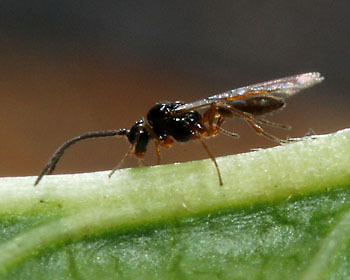 The surviving oviparae complete their development on the undersides of the leaves, and mate with winged males which migrate to the orchard in late autumn. Eggs are then laid in the spurs, on the older shoots and at the bases of the buds, mostly where the bark is fairly rough. Rhopalosiphum oxyacanthae has been recorded on 9 species of the Malus genus. Of those aphid species, Baker (2015) lists 29 as occurring in Britain: Anuraphis catonii, Anuraphis farfarae, Anuraphis subterranea, Aphis craccivora, Aphis fabae, Aphis gossypii, Aphis pomi, Aphis solanella, Aphis spiraecola, Aulacorthum solani, Brachycaudus cardui, Brachycaudus helichrysi, Brachycaudus persicae, Dysaphis plantaginea, Dysaphis pyri, Eriosoma flavum, Eriosoma lanigerum, Eriosoma lanuginosum, Eriosoma pyricola, Macrosiphum euphorbiae, Macrosiphum rosae, Melanaphis pyraria, Myzus ornatus, Myzus persicae, Nearctaphis bakeri, Ovatus crataegarius, Ovatus insitus, Rhopalosiphum oxyacanthae and Rhopalosiphum padi. Blackman & Eastop list 11 species of aphid as feeding on Cotoneaster species worldwide, and provide formal identification keys. Of those aphid species, Baker (2015) lists 7 as occurring in Britain: Aphis fabae, Aphis gossypii, Aphis pomi, Aphis spiraecola, Eriosoma lanigerum, Myzus persicae and Rhopalosiphum oxyacanthae. Paul (1977) found at least 16 aphid species recorded on grass roots in Britain: Anoecia corni, Anoecia furcata (= A. nemoralis), Anoecia major, Anoecia (Paranoecia) pskovica Mordvilko, Anoecia vagans (= Anoecia willcocksi), Anoecia zirnitsi, Aploneura lentisci, Baizongia pistaceae (=Pemphigus cornicularius), Forda formicaria, Forda marginata, Geioca setulosa, Geioca utricularia, Paracletus cimiciformis, Rhopalosiphum oxyacanthae, Smynthurodes betae and Tetroneura ulmi. 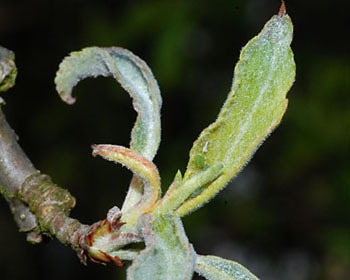 Whilst the first generation can induce leaf curling, it is more commonly caused not by aphids, but by apple powdery mildew (see picture below). This is a serious disease which is normally controlled by application of fungicide. Large numbers of apple-grass aphid can induce leaf curling perpendicular to the mid-rib, but the tree seems to rapidly recover from the damage once the aphids move to grasses in May. Hence most authorities do not consider apple-grass aphid very harmful. Since Rhopalosiphum oxyacanthae is the only apple aphid that overwinters on apple, Evenhuis (1968) argued that a winter wash against aphids in apple orchards made no sense. A better approach is to await spring and check what species are present. A fairly high initial apple-grass aphid population may be tolerated, because they will all leave by the end of May. 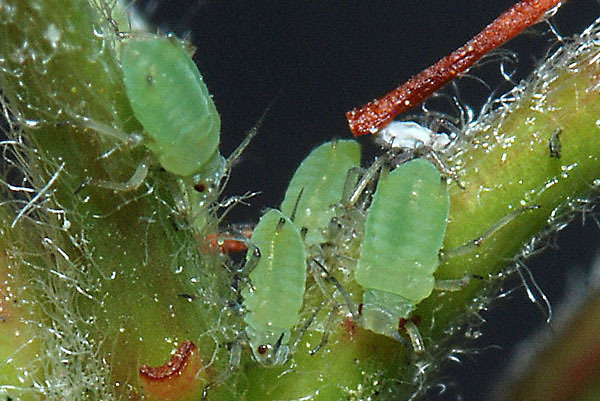 If rosy apple aphids are detected, then control measures may be needed. 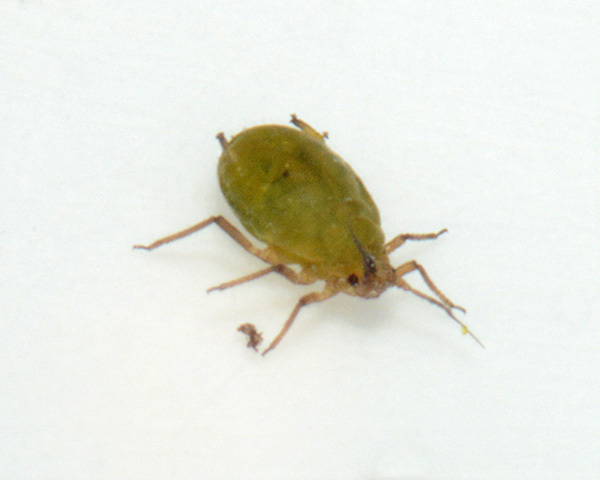 Orchard Pest Management Online, 2012 suggest the presence of apple-grass aphid can even be beneficial, as it may encourage aphid natural enemies to build up in early spring, increasing chances of natural control of other pest aphids. Contrary to this point of view, Mowat & Clawson (1996) considered that Rhopalosiphum oxyacanthae was an important pest in Northern Irish apple orchards and recommended an economic spray threshold of 30 trusses infested per 25 trees during green cluster to pink bud stage. However, Cuthberton & Murchie (2006) found that even when numbers in orchards in Northern Ireland exceeded recommended spray thresholds, there was no significant fruit loss. 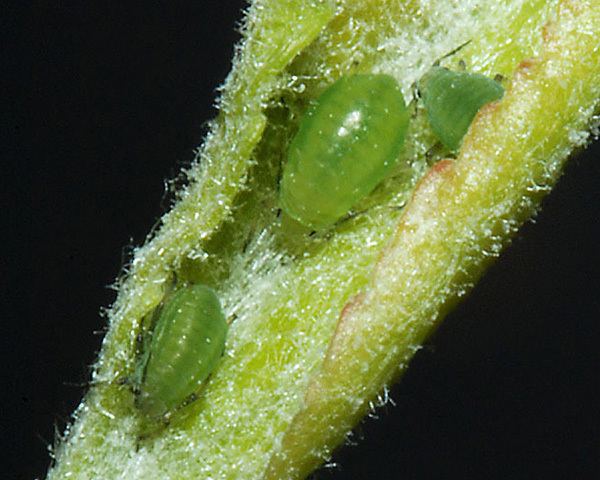 Moreover, numbers of apple-grass aphid were much higher in managed orchards where acaricide and aphicides were applied than in unmanaged orchards where only fungicides were used. We should also consider whether Rhopalosiphum oxyacanthae attains pest status on its summer host, namely grasses and (sometimes) cereal crops. 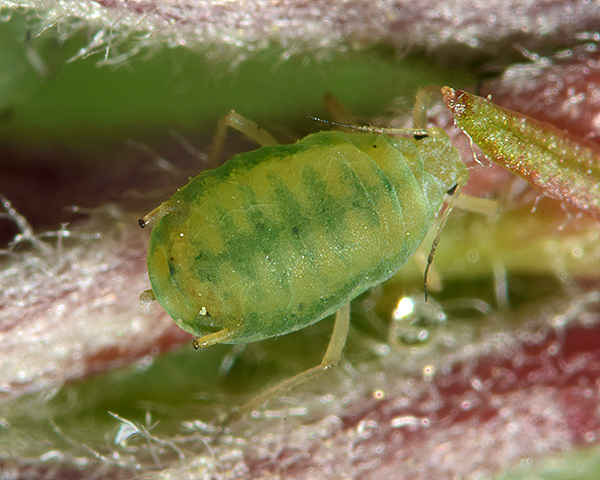 The apple-grass aphid is known to be an efficient vector of at least some barley yellow dwarf virus serotypes, but its importance as a crop pest is considered to be minor because it seldom colonises cereal crops. However, Teulon et al. (1999) suggest its importance may have been underestimated because it lives underground and is similar to the known cereal pest Rhopalosiphum padi. In New Zealand they found that Rhopalosiphum oxyacanthae made up a substantial proportion of cereal-inhabiting aphids in autumn-sown cereal crops as well as in some suction trap catches. Mowat, D.J. & Clawson, S. (1996). The need for pest control in Northern Ireland Bramley apple orchards. Crop Protection in Northern Britain 2, 225-230. Stroyan, H.L.G. (1952). The identification of aphids of economic importance. Plant Pathology 1, 92-99.